The parking lot was lined with police cars, and upon entrance, I was asked to walk through what appeared to be a mobile metal detector, and then my bag was rifled through by an officer. Men were patted down. The public had not heard a word from Chemours in the year since news broke of the nearly 40-years of chemical dumping from their Fayetteville facility into the Cape Fear Region’s air and drinking water supply – and at their first public appearance, the company set a tone of mistrust at the outset – ironically enough, their mistrust of the public, instead of the other way around. But, the company only magnified the already cagey atmosphere by prohibiting broadcast media from filming during the event, claiming that the church forbade video recording inside the building. 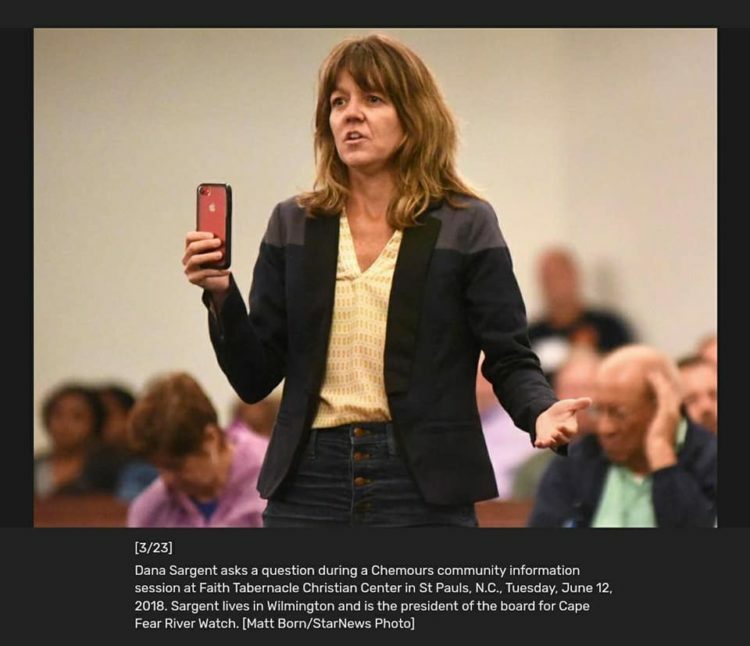 When a parishioner of the church corrected this falsehood by sharing that the church livestreams their services, Long simply did not respond and moved on with the program –a forewarning to the 200 residents in attendance that this event may not provide them the answers they came seeking. Many in the crowd have been ‘regulars’ at the NC Department of Environmental Quality (DEQ) information meetings on this issue – events where, after being provided the latest information available, attendees are welcomed up to a microphone to ask questions and discuss concerns with DEQ and Department of Health and Human Services representatives. We were not afforded this respect by Chemours. Instead, Chemours’ neighbors were required to write questions on a notecard and submit to a moderator who was clearly oblivious of the entire issue, but still attempted to summarize groups of questions into one, seemingly intent on hustling through this performance. Fumbling on the pronunciation of words that local folks have become all-too familiar with, he oftentimes misrepresented the questions that were posed – denying residents their voice. Several in attendance stated that their question was either not asked, or incorrectly asked. Long and the others from Chemours didn’t seem to be concerned about that. Long and Chemours’ Chief Toxicologist Gary Jepson did most of the talking, and it was clear, they came prepared with a set of approved talking points that they repeated ad nauseum throughout the evening. Long repeatedly touted the fact that the company was planning to spend $100 million on state-of-the-art technology to remove the chemicals from emission and discharge points by 2020. Yet Jepson said the data on GenX is “robust” and the company is “confident” that GenX does not pose a health risk. Both were met with deflection and defensiveness. Long responded to the first question with one line: “I think we are testing.” Jepson, in his defense of the second question, never seemed to consider that the provisional health goal is only for one of the 30-plus slew of per-and poly-fluorinated compounds that have been detected (so far) in our drinking water supplies. The 140 ppt health goal for GenX ignores the likelihood that Nafion byproduct 2 – which was found at much higher concentrations than GenX – is even more toxic than the GenX predecessor, C8 – the compound directly linked to cancers and kidney and liver diseases and that brought about the $670 million DuPont/Chemours settlement in the Ohio River Valley last year. We showed up to the Chemours town hall hoping to finally – after more than a year – have our voices heard by this company and to get some answers about what to do about dwindling property values and health and environmental concerns. Instead we were met with disingenuous answers, deflection, and suspicion from company executives. Perhaps most telling was their most discomforting evasion: they would not commit to a request that they hold a community meeting in the Wilmington area for folks who could not make the two-hour drive to St. Pauls. If they do, I hope they’ve learned from this experience. We expect answers, and we are paying attention.